Hello! Great to have you here, the kettle’s just boiled – what would you like to drink? Chicory coffee with milk if you have it! So, tell us a bit about yourself and your business. Where to start? I grew up in a quite untraditional family – my mum is an artist, potter and all round creative person. She used to make most of our clothes and I remember sitting under the sewing table playing with the offcuts when I was about 5 years old. I have always enjoyed creating something – whether it’s sewing or inventing a new flavour for my chocolate truffles. When I moved to UK about 16 years ago, I didn’t really know what I wanted to do – job vice – so I got a proper job and ended up managing a large social care company. Whilst doing my ‘proper job’ I would do the odd Christmas Craft Fair with my fabric decorations, handmade cards, vintage tea candles and more recently with my chocolate truffles. Cocoa & Heart is the name of my little handmade business. 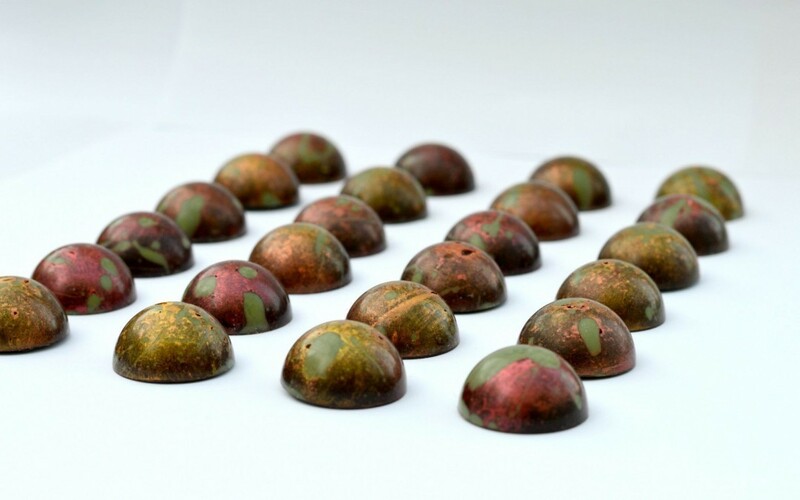 I focus on running baking and chocolate making workshops, but also make and sell my chocolates through local craft, farmer’s markets and my online chocolate shop. I also love sewing and crafting and run workshops in local craft shops. I think, if I was not made redundant in 2011, I would not be where I’m now. I had really stressful job working as a Managing Director and even though I was playing with the idea of setting up my little business before, this was not just a job you can walk away from. When I handed my work phone in and for the first time in 11 years had un interrupted weekend, I realised that I could not go back to the same job. I registered my business in 2012 and spent the first 3 months researching, setting up website and social media. Originally I focused on the sewing and crafts, but then the food side of the business really took off and I had to re-think what my business was about. I always knew, that it would be more difficult to incorporate all the areas into my business, but I really didn’t want to focus on just one. So, now my business is all about handmade living – I can teach you how to bake bread or homemade cheese, make you chocolate truffles or help you with your sewing. So, where does all this takes place? What’s your workspace like? This is where I work most of my time – my kitchen. You can often find me catching up with e-mails on my laptop whist the bread bakes in the oven. I do have a ‘proper’ workspace in the attic where I sew and do my admin, but find myself working everywhere in the house. The best bit? You can do pretty much what you like. The worst bit? You can do pretty much what you like – which means you need to be super organised and know, which bit is actually worth doing or not! At the moment, I’m considering to get more space for my baking workshops and I’m planning to start running sewing and crafting workshops through my own business. Finally, where can we find you online if we want to keep in touch? Thanks so much for your time and chatting to you about your business! Thank you for having me and great to talk to you!